I went down to the area near the Ministry of Interior this morning (on both the protestors' side and the police's side) to see the new fortifications built in the last day or two. Two whole new concrete block walls have been built on Nubar St. and Mansour St., the main sites of confrontation in the last few days, but there were still a few hundred protestors shouting slogans against SCAF on Mohammed Mahmoud St. That makes it a total of four concrete walls blocking major Cairo thoroughfares, not counting the one on Mohammed Mahmoud St. that was destroyed a few days ago. This is the wall on Mansour St. which saw some of the most intense fighting. 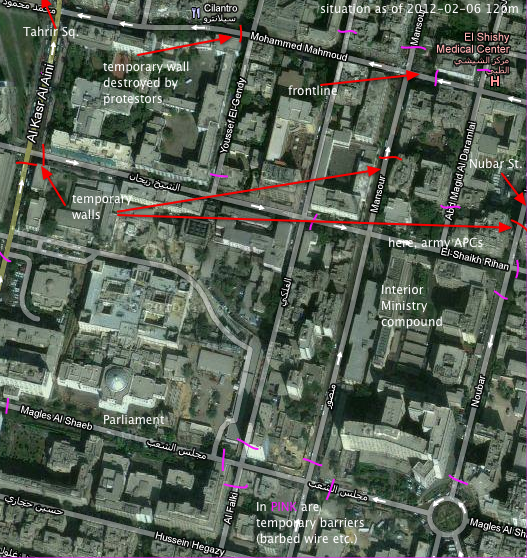 As this Ahram article notes, the police have gained the upper hand and returned the fighting to Mohamed Mahmoud, where it is faily contained. 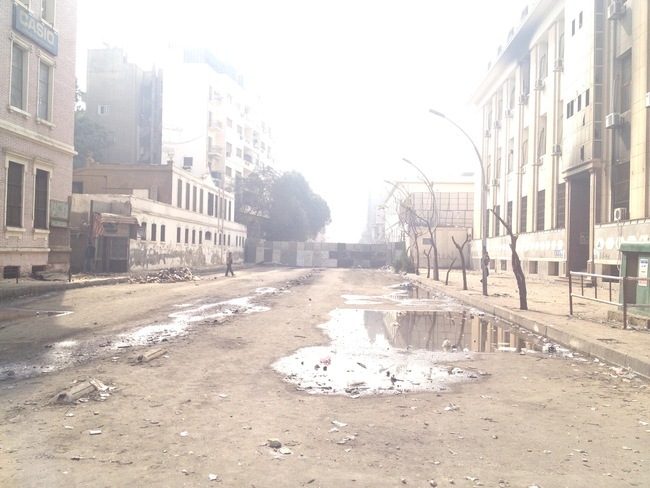 Of course large swathes of Downtown Cairo now look pretty apocalyptic, and local residents are not happy. I was talking to some people this morning and an elderly bearded man came who was pretty unhappy, and accused journalists like of making money off the pictures we take of all the fighting (which I suppose is true in a literal sense, but he meant it in terms of we're being paid to sully Egypt's image). I got out of there pretty quickly. No surprise that things are tense, and I'm sure the residents of Downtown Cairo think the protestors are hooligans. SCAF is making panicked moves that only seem to confirm its mistakes: moving Mubarak to a regular prison, separating the political prisoners from the former regime, imposing travel bans on personalities seen as close to the Mubaraks, etc. The bottom line to all this is that SCAF appears to be losing credibility in the general public's eye – this is what an early presidential elections means – and hence its bargaining power is quite constrained. That's the case even if people will tire of protests. The danger at this point is that SCAF uses other issues, such as the prosecution of foreign NGOs, in order to divert attention away or even foment the conspiracy theory of a foreign hand being behind all the troubles. I don't think that Sam LaHood is about to be accused of being behind the Port Said stadium disaster, but unfortunately there is a lot of conspiracy theorizing on all sides – as if the football fans were not at least partly responsible for the disaster themselves, and only SCAF/regime remnants/invisible hands can be held responsible for things. This passing of the buck is a worrying aspect of the mentality of Egyptians on both sides of the revolution/stability divide, unfortunately.